What are they and should you consider them? Lab-grown (or lab-created) diamonds are chemically, physically and optically identical to diamonds dug out of the ground. What that means is the only meaningful physical difference between them and ‘natural’ or mined diamonds is where they come from. When you consider ethics however, things get a bit more complicated. You’re probably familiar with the story behind ‘blood diamonds’. Conflict-funding is much less of an issue these days, but there are still plenty of problems. Because it’s such a big subject, here we’re just going to give you a quick run down. CVD (carbon vapour deposition) lab grown diamonds. First up, the big environmental issues with diamond mining are habitat destruction, water usage and greenhouse gas emissions. There are major social concerns with worker exploitation, especially in the Artisanal Small-scale Mining sector and diamond cutting industries. Likewise there are big problems with with criminal corruption, violence and with fraud (often in the form of incorrect grading). You can easily find a litany of case studies on-line highlighting these problems. But steps are being taken to improve the situation. The Kimberley Process, and more recently Blockchain initiatives are being installed to legitimize and provide traceability within the industry. But there’s still a long way to go. The fact remains that a great many diamonds on the market today cannot be traced back to their point of origin. According to the International Grown Diamond Association, diamond mining generates around 57kgs of CO2 equivalents for every carat of diamonds produced. From the figures above, a one carat diamond has a ‘carbon cost’ of around 57kgs. By comparison, an iPhone X has a carbon cost of around 79kgs over its lifetime. 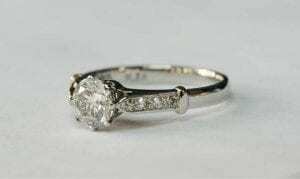 So when you consider a diamond will last many lifetimes, its carbon cost isn’t out of this world. Lab-grown diamonds don’t suffer the same social and environmental issues that mined diamonds do. However, they do cause issues within the industry. When they first appeared on the market (in the early 90’s) there were a lot of problems with cheap, lab-grown diamonds contaminating the natural diamond supply chain. In particular among small accent-sized stones. These issues have largely been eliminated now with the process of laser inscribing – part of self-regulation by the lab-grown diamond industry. Similarly, the natural diamond industry has developed sophisticated detection equipment to help stamp out the problem. With the availability of renewable energy and the potential to off-set carbon emissions, lab-grown diamonds can be carbon neutral. However, because most lab-grown diamonds are produced in places like China and India where coal-fired power stations are the main source of electricity, the eco-friendliness of lab-grown diamonds is not as clear cut as it at first seems. That said, because producing diamonds in a laboratory uses very little water and does not result in habitat destruction or environmental pollution, they remain an environmentally sound alternative to mined diamonds. For an update on diamond ethics, take a look at our most recent blog article on the subject. Vintage style eight-claw ring in recycled platinum with a lab-grown diamond as the main stone and recycled diamonds on the shoulders. 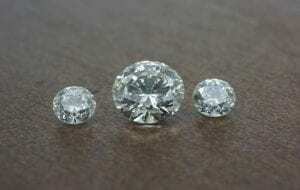 Lab-grown diamonds are graded in a very similar way to mined diamonds. Indeed, some grading companies use exactly the same criteria. When making your choice, you’ll still need to consider cut, clarity, colour and weight – along with your own ethical considerations. Take a look at our diamond buying section here to learn more. By the way, Hoover & Strong are wholesalers, so they don’t sell to the general public. But you can look online at what they have to offer. This recent blog article of ours will give an insight into what’s going on in the lab-grown diamond space right now. If you would like to create an engagement ring or other jewellery piece with a laboratory made diamond, contact us today. Or if you’d like to learn more about designing your perfect engagement ring first, you’re welcome to download our free Engagement Ring Design Guide.